Wine was always a part of my life and family culture. Growing up in an Italian American family, wine was on the table at every meal. Even at a young age, all of the grandchildren would have wine with Sunday dinner at my grandmother’s house. Wine was not taboo for us, as it can be for many American families. When I started in the hospitality industry after college, I followed my passion for not only wine but beer and spirits and all aspects of beverage service. When I was working at a French restaurant about 8 years ago, I had an older guest that would bring in bottles from his cellar. He told me “I have more bottles than I can drink before my time is up, and I want to share them.” I would not call him a mentor but an inspiration. He brought in a bottle of 1942 Cheval Blanc and told me the story a story of the struggle of the French Wine industry during World War II, and how challenging it was for the winemakers and farmers to continue wine production as well as hide their stock of bottles from the invading German army. His story changed my perception of wine. That bottle and story made me realize just how important wine was in history, to culture and civilizations. Wine became my life and I have been studying ever since. A sommelier is more that just a wine expert. We are the epitome of hospitality. More than anything, we strive to deliver an experience to each and every guest that they will remember forever. Our skillset should include, but not be limited to wine knowledge, beer knowledge, spirit knowledge, culinary knowledge, world history and geography, local events and history, service standards. We should have a debonair attitude, suave demeanor along with grace and poise, while continuing to be gracious and humble. Network. Make contacts everywhere you go. Stage at anyplace that will let you. Send thank you cards. Make people remember you. I have had more job offers from colleagues recommending me for a job than I have from jobs that I have applied to myself. DON’T TRY TO UP-SELL! Yes, we are in business to make money, but the goal should be to create lasting relationships with guests that come back time and time again. When a guest comes to me and they are looking for a wine, I don’t try to sell them the most expensive wine, I try to sell them the wine that will be best for them. I ask them what they are looking for in a wine, flavor profiles, body, sweetness, etc. If there is a specific wine that they have had in the past that they enjoyed will also give me a benchmark for flavor, region and price range that they are comfortable with and I will start there. I would rather sell them a lower priced bottle, build a relationship of trust with the guest, and have them come back over and over again, then get one big sale and never see them again because they felt taken advantage of. I love the idea of having a specific glass for each wine, but that is not always practical. If you have the space to allow for storing that dozens of different types of glassware, it elevates your wine program to another level. I stick with a simplified glass program, we have a Burgundy glass, a Cabernet glass and a Chardonnay glass for our still wines, flutes for sparkling, and specialty glasses for port and cognacs. We have a 50/50 mix of well known producers and small boutique wineries/ cult wines. 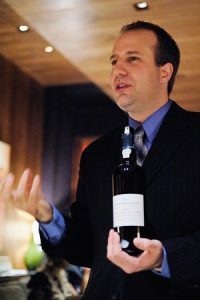 Well known producers such as Robert Mondavi, Silver Oak, Beaucastel, give guests comfortable choices, smaller producers give oenophiles a chance to explore the wine list and try something new. About 10% of our list is from atypical wine producing regions or less common grapes for the adventurous wine drinkers that want to try something that they have never heard of, like an Areni Noir from Armenia. No matter who or where the wine comes from, the wine must taste varietally correct, deliver for the price (hopefully over deliver). All wines are tasted before being considered. When tasting, I never ask for the price of the bottle. I taste the wine and determine how much I would pay for the wine, if the selling price matches or is lower than my taste expectations, then I will put it on my list. There are so many rules when it comes to pairing wine with food. Classic pairings of dry Riesling and crab, Cabernet with steak, Chardonnay with scallops. At our restaurant, we have a large selection of sushi and Asian inspired dishes, and many of our guests prefer California Cabernet and Pinot Noir (our two best selling varietals). These wines are not great to pair with sushi, especially the Cabernet. I would rather the guest drink what they prefer then try to convince them into a more classic pairing. Just because a book says “never drink tannic red wines with fish” ….if the guest enjoys it, that is the most important part. We, as sommeliers, tend to over analyze our trade too much. It comes down to giving the guest what they want. What is the goal of the wine list? Specific focus on one growing region such as France, US, Germany? or more varied? How much are you willing to invest in standing inventory? Who is going to be doing most of the selling of the wine? Wait staff? Sommelier? How much time do you have to invest in training the wait staff if they are selling the wine? If the wait staff is selling the wine, and you cannot commit to training the staff a few hours a week, then you should keep your list fairly small or the staff will not be comfortable selling wine. If you only have enough storage or capital to inventory 50-100 selections, then your selections must be carefully selected so that they move fairly quickly. Wine lists that have 500+ bottles and programs that do not have any concerns with a high static inventory can keep bottles for multiple years, create verticals, and have boutique wines that do not sell themselves and age well. As far as pricing, that varies from restaurant to restaurant. The industry standard has always been 3x markup on bottles and glass price is retail price of the bottle. My pricing is a bit different. We are a more upscale restaurant for our area, and our building and decor cost more than our competitors, therefore we have more to pay for. Our prices are a bit higher than the restaurant around us, although we do not want to price ourselves too high. I check wine lists twice a year from the restaurants in our area to make sure that we are competitive. We provide a higher level of experience than the restaurants down the street, and the higher price translates into a better guest experience, better ambiance, better wait staff. Ridiculously priced wines are less common than they used to be with the help of smart phones. It keeps the business owner honest. Most guests can get a general idea on what bottles cost by checking on their phone to see if they are overpaying for a wine. Of course there are always exceptions to the rule, and Pennsylvania is one of those exceptions. There are no wholesale pricing discounts for restaurants, so we pay retail. On top of that, Pennsylvania borders free market states with liberal beverage laws (New Jersey, New York and Delaware) and we always seem grossly over priced compared to our neighboring states. Read. Stay on top of the industry, do your research. Network. Start a tasting group or join one. I subscribe to a few magazines, online newsletters, read websites and just talk with other people in the industry. Vendors are a great resource as well. Scores don’t impress me. As much as I read Decanter, Wine Spectator and other magazines, I never look at scores. Recommendations from other wine professionals and guests that have really enjoyed a wine grab my attention. Rose. I know it’s not a variety as much as it is a style…. But it’s such a beautiful style of wine that is often overlooked. Can be subtle or powerful, sweet or dry, fruity or earthy. One of the most dynamic and complex styles of wines that is not appreciated as it should be. Pinot Noir – Oregon mostly, but there are quite a few Volnay in my cabinet as well. Syrah/ Shiraz- I love the Rhone Syrah based wines, but Australian Shiraz (Penfolds RWT, Mollydooker’s Velvet Glove) are amazing! Gruner Veltliner / Austrian Whites – crisp minerality. My favorite summertime wines. Grauburgunder, Weissburgunder…Amazing!